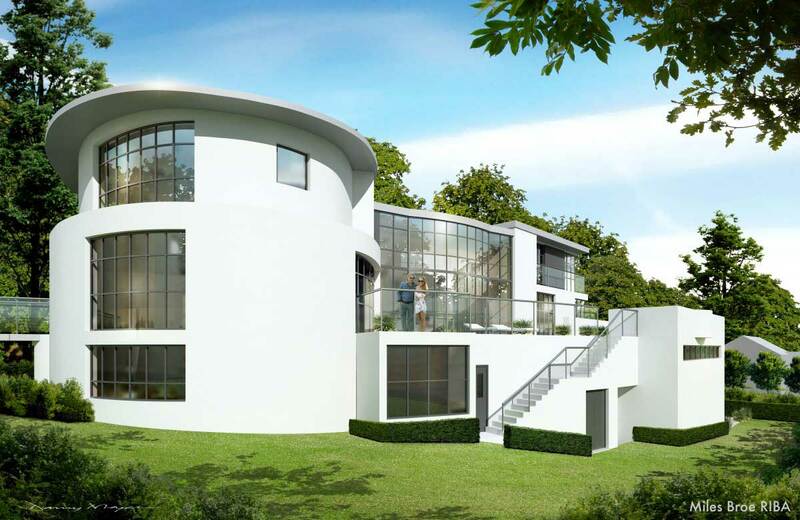 This new bespoke home is produced in an art deco style with flowing curves and terraces. 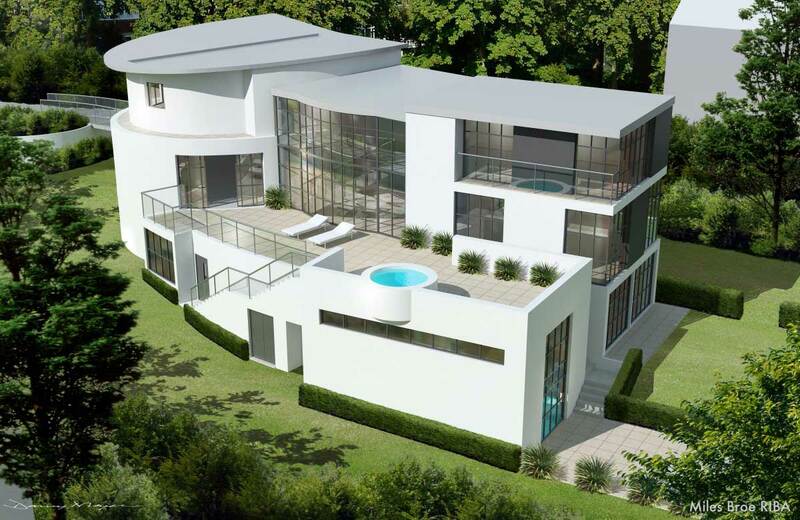 The house comprises five bedrooms all with en-suite bathrooms, which are accessed via a lift. Over a 2 year period my Clients procured 4 large detached houses built during the 1970's on prime land in the Withdean district of Brighton overlooking the sports arena currently the temporary home of Brighton & Hove Albion Football Club. The subsequent planning application was for the demolition of the existing houses and creation of a scheme of 5 new houses of 650 m.sq each, designed in the idiom of 1930's seaside resort housing. There were significant planning issues of overlooking and the site location due to the proposed expansive terraces required to take advantage of the south west orientation, together with the steep topography impacting upon vehicular access and compliance with Life Time Living requirements. We designed the lower level garaging and pool room to sit below the transfer deck forming the main residents access and living accommodation at ground floor level as shown on our design visuals. There is a central hoist which serves the upper floor directly from the lower floor kitchen; within the lower ground floor there is a double garage, gymnasium and infinity exercise pool. Due to site constraints, the new houses will be steel framed structures with beam & pot pre-cast floors, blockwork outer skins and low pitched zinc roofs, all placed in-situ by a centrally located tower crane. The practice now has now produced the construction drawings. The build period is split due to market conditions and Plots 1 & 2 were programmed for a duration of 50 weeks from May 2009. The high level of specification and technology, together with the budgets allowed for the interior design fit out and architectural landscaping, have achieved an end value by the Bank's Valuers in 2008 in the region of £3.6m per house.